Beautifully engraved certificate from the Cincinnati, Indianapolis, St. Louis, and Chicago Railway Company issued in 1887. This historic document was printed by Franklin Banknote Company and has an ornate border around it with a vignette of steam engine . This item is hand signed by the Company's President and Secretary and is over 119 years old. This company was organized by the merger in 1889 of the Cleveland Columbus Cincinnati and Indianapolis Railway Company, the Cincinnati Indianapolis St Louis and Chicago Railway Company. Melville Ezra Ingalls (1842-1914) was born in Harrison, Maine. After working on the family farm, Ingalls started his career as a teacher, studying at Bridgton Academy. In 1862 he entered Harvard Law School and received his diploma one year later. Ingalls first practiced law in Maine and later in Boston where he practiced for the firm of Woodbury and Andros. In 1867 he married Abbie M. Stimson of Gray, Maine. Over the years they had six children. In 1868 he was elected to the Massachusetts State Legislature and served one term. One of the cases assigned to Ingalls in 1870 involved the financially troubled Indianapolis, Cincinnati and Lafayette Railroad. Woodbury and Andros clients owned a significant portion of the railroad and they decided to place Ingalls in charge of the railway. He moved to Cincinnati in November 1870 and was elected president of the railroad. The line fell into his receivership in 1871 and he was able to reorganize the company. Financial woes continued and Ingalls again became the receiver in 1876. Ingalls rescued the railroad by securing voluntary subscriptions from the stockholders which he used to pay off the debts. In 1880 he consolidated his company with the Lawrenceburg line to form a new company called the Cincinnati, Indianapolis, St. Louis & Chicago Railway of which he was the president. 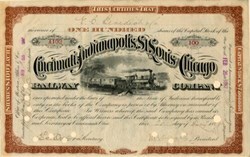 Ingalls' financial ability in railroad management attracted the Vanderbilts who controlled the Cleveland, Columbus, Cincinnati & Indianapolis Railway, also known as the Bee Line. In 1889, the two companies' interests were combined into a new line called the Cleveland, Cincinnati, Chicago & St. Louis Railway. Nicknamed the Big Four, Ingalls was elected the new company's president, a position he retained until 1905 when it was assumed by the New York Central. Ingalls continued to direct the venture and became chairman of the board of directors until his retirement in 1912. Ingalls also became head of the Chesapeake & Ohio Railway in 1888 and received credit for developing the line into one of the country's best. In 1893 he established the Chesapeake & Ohio Steamship Company with headquarters in London, England, and continued to direct the company until 1900. Ingalls also was instrumental in developing the coal mining industry in Kentucky, operating the Kentucky Central Railroad from 1881-1883, and built a resort in Hot Springs, Virginia. He was also involved in other rail ventures and became a business leader in Cincinnati. In 1902 he had the fifteen-story Ingalls Building constructed in downtown Cincinnati, at its time the largest in the city. Ingalls also ran for mayor in 1902 on the Citizens/Democrat ticket but was defeated. Ingalls retired from active railroad management in 1912 and spent the remaining two years of life living between his homes in Washington, D.C., and Hot Springs, Viriginia, where he died in 1914.